Have you ever imagined eating a pasta dish with two of your favorite breakfast staples, Foodies? 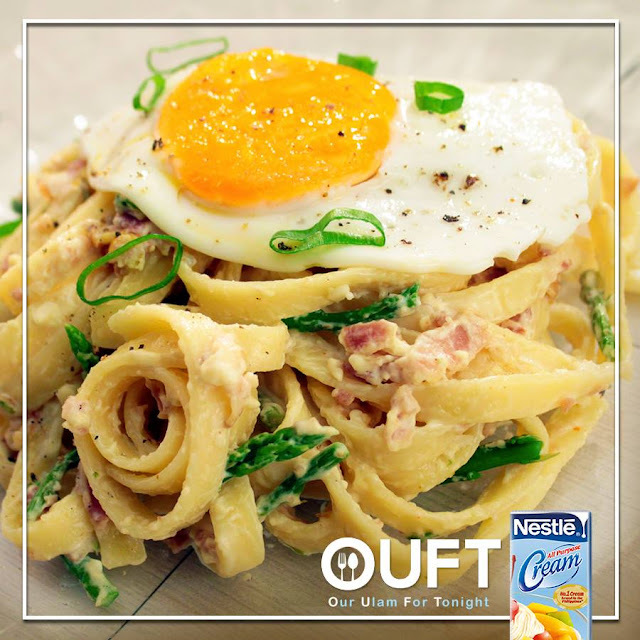 This Creamy Bacon and Egg and Pasta, made even richer and more flavorful with NESTLÉ All Purpose Cream, makes it possible! Try it for our ulam for tonight! 1. In a sauté pan, cook the bacon and garlic in the olive oil until fragrant. 2. Add in the asparagus and sauté for another 2 minutes. 3. Pour in milk and NESTLÉ Cream. Season with salt, cayenne, and black pepper. Cook for 1 minute. 4. Add in the cooked pasta and toss with the parmesan cheese. 5. Garnish the pasta with the fried egg on top and more black pepper.